What’s with all these furless creatures in tuxedos? So if the squirrel comes out of its nest today and sees its shadow, what does that mean? Six more weeks of temperatures in the negative integers? Perhaps the early Spring the weather is now about-facing into this weekend? Does it even matter, or have we all learned our lesson from Buster’s experience last year not to rely on rodents to predict our seasons? Though the groundhog gets all the fame, fortune and reach arounds from the weirdos in Punxsutawney… it is the squirrel who should be the expert in the meanings of shadows. After all, the word squirrel traces its origins back to at least the ancient Greeks… who combined the root words skia (shadow) and ouro (tail) to form what became the modern English word squirrel. Squirrels are quite literally shadow tailed! How cool is that? Cooler than a stupid groundhog, right? If I close my eyes, I won’t see anything and maybe it’ll warm the hell up! And that does it for this Candlemas Day edition of Saturday Shadow Tail! This entry was posted in Saturday Squirrel and tagged etymology, groundhog day, photo, photography, shadow, squirrel, tail. Bookmark the permalink. Much cooler than a groundhog (although I would love to see one)! Put some food out… you never know who will show up in your backyard. Please let it be a bear! 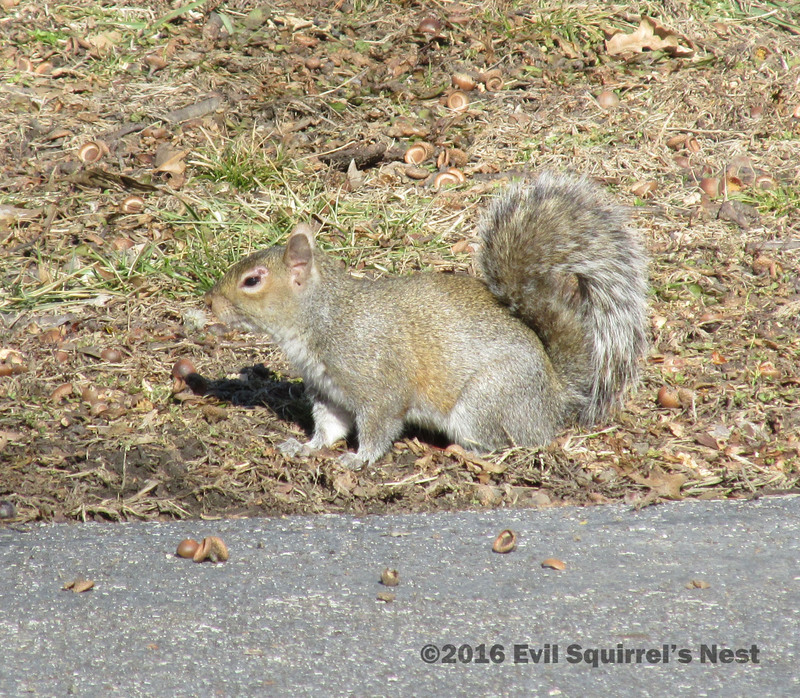 I just came back inside from walking Teddy and had squirrels yelling at me from the trees in the back yard around the bird feeders…….”what the heck lady – where’s the food?” “you expect us to survive in this cold with no seeds?? ?” “what an outrage – I’m reporting you to the SPCS!” (yeah you can figure that one out I’m sure). The resident groundhog (two yards over from here) was nowhere to be seen. Around here I guess we look to squirrels for the prediction of spring and I’d say from the mood of the squirrel population here, they could care less – they just want food. That’s true… hunger knows no season. I was watching one Thursday morning build a nest in the neighbor’s tree. They need something to give them all that energy to do stuff… of do stuffs as my spammers would say! Squirrels always know what is going on. This one is a cutie too. But seriously, is there a squirrel who isn’t cute? 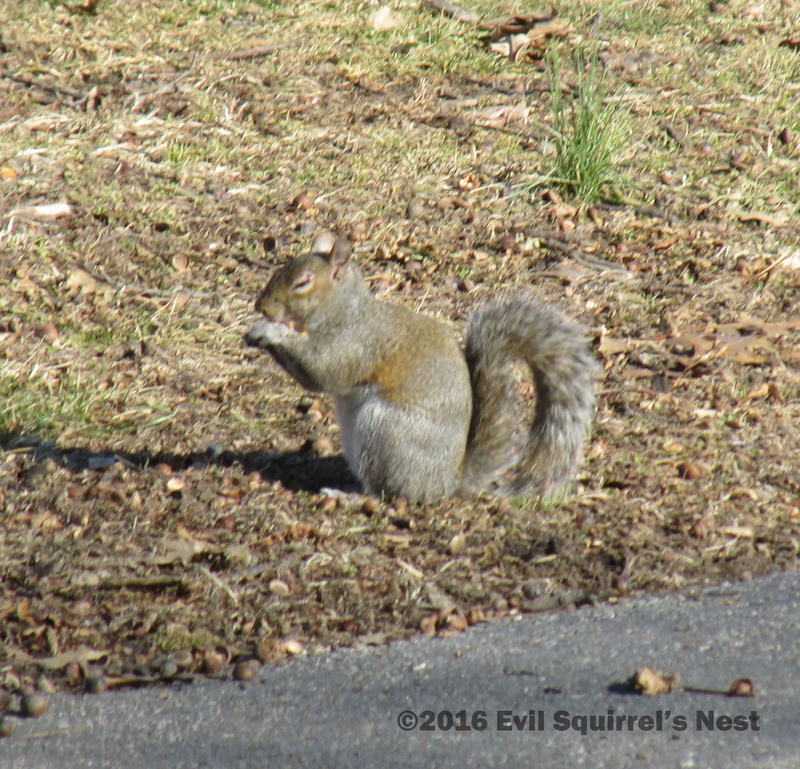 I’m sure there are squirrels who aren’t cute… but we never see them since they wear little bags over their heads. Ha! I’d pay good money to see if those goofball tall hat handlers could rangle a squirrel. Now that would be a forecast! I don’t think the squirrel cares, he’s only interested in his nuts. Shadow tail? Now that’s squirrel trivia worth knowing! Since I’ve never personally met a woodchuck, I’m ready to go with squirrels. Maybe if I lure them into my feeder, they will favor MY weather! Your guest weather-squirrel today is apparently a scrapper! However, the scrape over its eye is healing nicely. ❤ Too ice cold where you are to get infected maybe? Here we are having 53 degrees at the moment and expecting a high of 65. The frogs outside are singing for joy and will repent of their ways when Friday drops to 25 overnight. I would trust that squirrel’s prediction over Punxsutawney Phil’s. That evil groundhog predicted an early spring, and while he wasn’t entirely wrong in his prediction, it seems kinda messed up that it was in the mid-seventies here just yesterday… and less than 24 hours later, it’s a whopping 40 degrees colder. I nominate that squirrel to do Groundhog Day predictions from here on out.